And it just gets better every day! 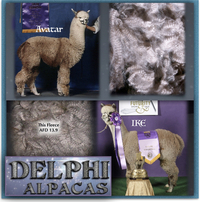 FIRST & Gray COLOR CHAMPION out of 35 grays ~ 2012 ABR Fall Festival Fleece. FIRST Place class of 8 ~ 2012 AOBA Nationals Fleece, Silver Grey Male Juveniles. We will be sad to see her go! But we are happy for her - she is going to a wonderful new home. But first she'll be delivering her first cria here - a cria that we are super excited about! After delivering, she'll be bred to Gray Enough - (awesome match!) - We are so excited about that baby! Ziah is a superb quality no fault girl, her parents are the very best in grey today. Priced to sell - only because everyone is for sale! Come see him and take him home from GWAS. Every time I open his fleece I'm tempted to take him off the sales list. But there's a lot of that going on here - it's just a great time to buy at Delphi. His 'Buy it Now' price is $5000 - for a little black rock star from rock star gray genetics. 3rd place at Nationals, with very nice comments - beaten only by the breeding program that also produced the black male National CC and RC. We'll have a chance for a do-over at GWAS, (wink) - I can't wait to see how Nox does, he just gets better every day. with a champion classic silver sire, and 2 classic gray champion maternal grandparents. 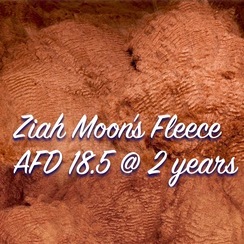 Nox is super dense with stunning fleece character - fine, soft soft handle - bright bright bright. Nice solid conformation - very well grown young man. You will love him - we do! Fantastic pedigree - check out his certificate. This boy was created to be a herdsire. 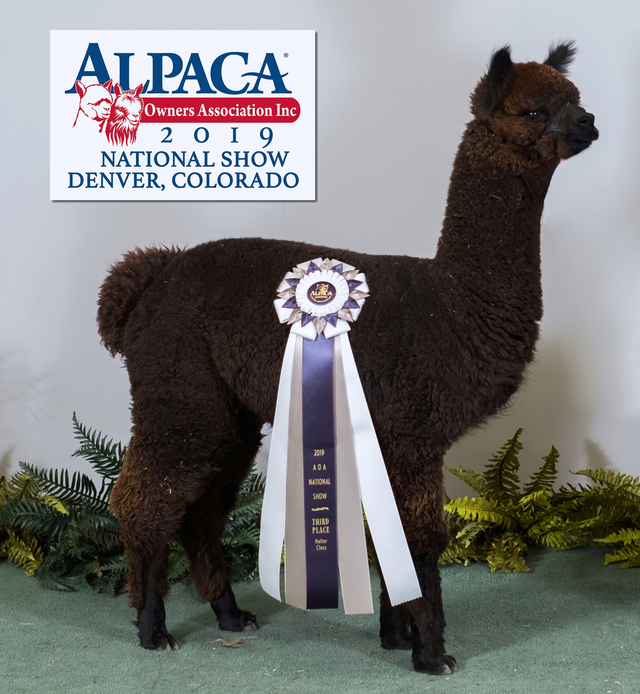 His sire, Aeon, won the gray Color Championship at Fallfest out of 35 gray entrants, as well as a National Blue in a class of 8 - for his stunning bright crimpy silver fleece. 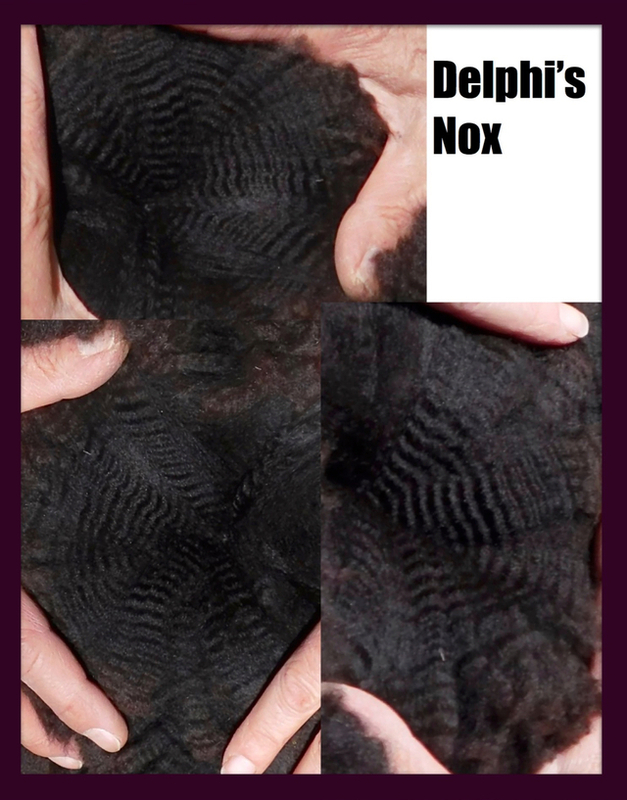 Nox's mom Ziah Moon - is a product of the Very best of Delphi's herd. to reach our teeny tiny herd goals. This is a great place to buy boys!